Two modified electrodes (Pb/PbO2 and C/PbO2) were prepared by electrodeposition of lead oxide layer on lead and carbon substrate. These electrodes were used as anodes for electrocatalytic oxidation process of picric acid in aqueous solution. 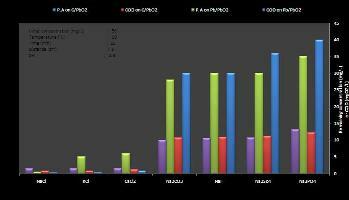 The results of the electrochemical degradation process of picric acid solutions were expressed in term of the remaining concentration (mgL-1) and chemical oxygen demand (COD) values (mgO2L-1). Different operating conditions and factors affecting the treatment process for electrocatalytic of picric acid including current density, pH, initial concentration of picric acid, conductive electrolyte and time electrolysis were studied and optimized. For removal of picric acid, C/PbO2 electrode indicated higher efficiency than Pb/PbO2 electrode.